Now I know most of you are not a fan of this day however there isn't too much we can do about it so let's make it a good one...with some very strong coffee of course. There are a few trends that I'm totally loving right now. 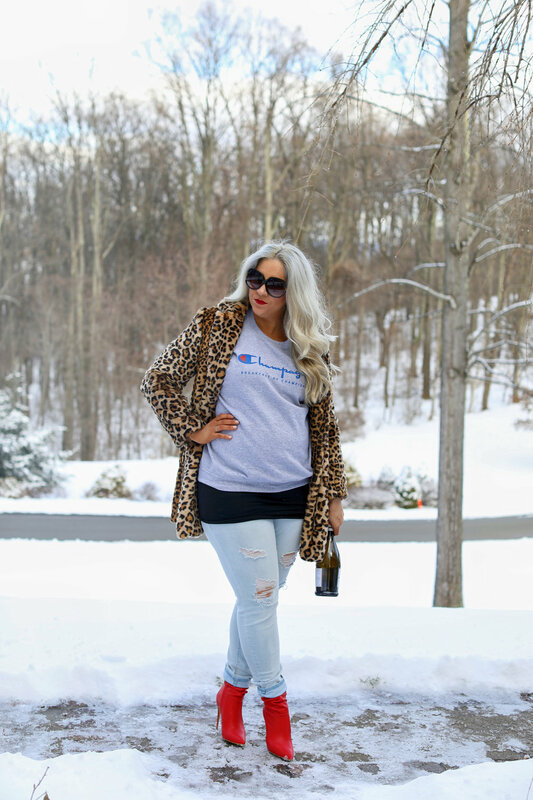 Graphic sweatshirts and red shoes. Before I go any further, trend or not I'm on board with both of these all the time. But, a lot of times I want to be comfortable or now a days don't have much time to change. I'm sure you've seen the many, many Instagram accounts with the sassy slogan sweatshirts. I can't help but love a snappy worded shirt. My favorite Insta account is "Coffee In The Shower" (something I've been known to do as well, haha.) I've followed them forever and have a couple of their sweatshirts. This one is my newest. 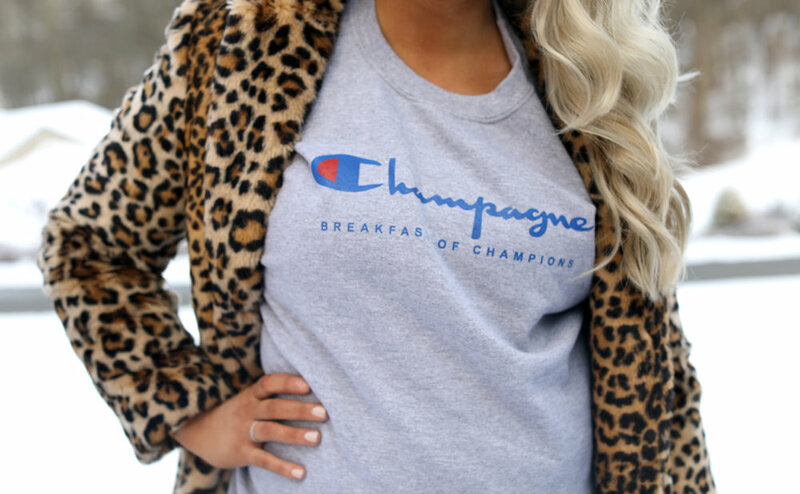 Who doesn't love champagne for breakfast? I feel like it's an old way of thinking that sweats are only for lounging so here is a way to elevate your slogan sweats so that you can feel free to wear it wherever your feet may take you. Even though I've got spring fashion on the brain, we've still got a couple more months of winter and what a better way to warm up than with some red hot heels? These fab booties are of course from JustFab and I'm obsessed! It takes your casual look up a couple notches! Add leopard and champagne and you're in business! It's Monday, we're tired. So here is to hoping that your Monday is good and your coffee (or champagne) is very very strong.